If you ever go to Manhattan Beach you’re in for a treat — Bonjour et bon appetite! With only around eight tables, this little gem of a restaurant appears unnoticed by most passers-by whilst it is in fact more than ideal for warm family meals or intimate dates. As a sucker for freshly cooked crepes, before I knew it the sign outside had lured me into the beautiful restaurant with a dark wooden interior, adorned with candles and laced white place mats. The rich decor made me wonder if my student budget would stretch that far, but to my relief, I was pleasantly surprised. Everything is perhaps only a dollar or two more than what I’d usually spend on a meal out. Naturally, I reached straight for the dessert menu and read through the extensive list of toppings. I chose the crepe enveloped pears, drizzled with rich melted chocolate, coupled with vanilla ice cream and of course, topped with whipped cream. Since then, I have returned and tried the crepe full of sliced strawberries and bananas coated in warm Nutella, again accompanied by vanilla ice cream and whipped cream. Other crepes on the menu are soaked in rum and set alight once set on the table, or the freshly prepared fruit coated in chocolate fondue. Whilst the desserts are exceptional, the rest of the menu is prepared just as carefully to order from scratch. I can personally recommend their pasta Carbonara - although finishing the dish is a feat! Portion sizes—even the salads—are huge. Creme de la Crepe didn’t forget to include snails on the menu, and waiters all have French accents which adds the authentic touch. 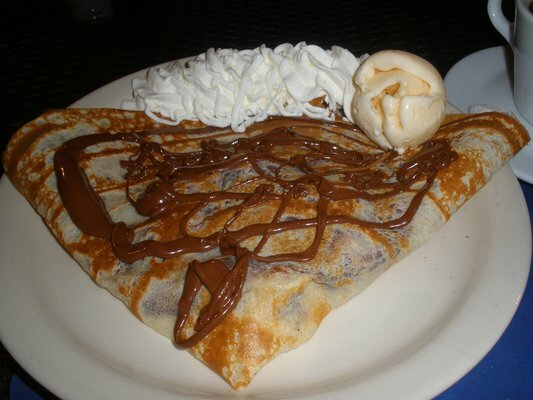 There is a Creme de la Crepe location in downtown Long Beach, in the corner of First St. and Elm Ave.